If you were taunted with words like "fag" and "dyke" daily in school, to what extent would this affect you? Perhaps the experience would keep you hiding in the closet for years, send you into a depression, or lower your academic achievement. Maybe the homophobic culture of your school would convince you that gay people are inferior, and you might start using the ubiquitous phrase "that's so gay" to describe every unfavorable person, place, or thing. That was the tragic consequence in April for a sixth grade Massachusetts student named Carl Walker-Hoover, a victim of anti-gay bullying. People who knew Carl described him as flamboyant and effeminate. He defied gender expectations. Although he did not identify as gay, students harassed Carl daily, calling him names and saying disdainfully that he acted like a girl. The fact is that this type of hate language, used against lesbian, gay, bisexual, and transgender, or LGBT, youths, is common in American schools. Students who are LGBT - or are perceived to be - are frequently bullied. In fact, sexual orientation is, according to a 2005 nationwide survey, the second most common reason for repeated harassment in schools. "Words such as 'gay,' 'fag,' and 'queer' are often used as the most hurtful insults students can throw at one another." My sister, Kaitlyn Hanlon, was Carl's summer camp counselor. She organized the Day of Silence at Springfield College to commemorate Carl and to educate the community about the serious consequences of anti-LGBT attitudes in schools. The extended Walker family attended the event, which, ironically, fell on Carl's birthday. Tragically, the day prior to the Day of Silence, another 11-year-old boy took his life in Atlanta, after frequent anti-gay bullying. 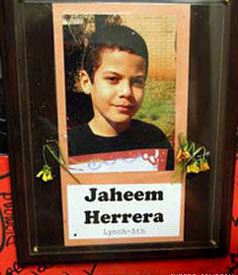 Fifth-grader Jaheem Herrera's circumstances were eerily similar to Carl's. They both had reached out to school officials for help, but had no faith that enough was being done to change their situation. Both children decided that the only way to stop the harassment was to hang themselves. Despite Americans' changing attitudes toward LGBT people and the existence of more-positive portrayals of gay characters in the media, children are still receiving the message that it is abnormal for two people of the same gender to love each other. Words such as "gay," "fag," and "queer" are often used as the most hurtful insults students can throw at one another. Two men showing any affection is frowned upon. When I watched the presidential inauguration with second graders, the children exclaimed, "Ewww! That's gross!" as the male politicians kissed one another on the cheek. At a young age, children begin to use the word "gay" as a put-down. Recently, a second-grade girl called her classmate "gay" because he was walking with his arm around another boy. I have heard children refer to the word "gay" as the "g-word," implying a belief that this word is not appropriate to say when speaking with a teacher. This is not surprising, considering that most students have never heard a teacher use the word "gay." Imagine how profound it would be for students to hear their teacher speak about gay people in a neutral context, rather than within the usual, negative context. Carl Walker-Hoover was only one of countless students who have been hurt by anti-gay harassment. Many of them suffer consequences that can include risky behavior, depression, poor academics, and homelessness. But sometimes, as Carl's story shows, the consequences also can be fatal. Like Carl and Jaheem, a 17-year-old Ohio student named Eric Mohat committed suicide, in 2007, after being bullied for his perceived sexual orientation. The following year, an eighth grade California student, Lawrence King, was shot and killed in his school. The classmate who killed him had repeatedly harassed Lawrence for being gay. We can hope that educators will draw courage from the example of Carl Walker-Hoover's mother and do their part to help put an end to this bullying. The lesson from these tragedies should be clear: It is long past time that we create positive changes in our schools that can lessen hateful speech and avoid real heartbreak.